Cameras have long been a critical part of the conservationist’s toolkit. Both still and moving images have been used, among other things, to record the existence of new species (or those once so rare as to be considered extinct), document the appearance of species in new or unexpected habitats, capture evidence of interesting and unusual animal behaviours, and captivate audiences who might never have a chance to interact with wildlife in person. Over the past few years, it has become progressively easier for nature enthusiasts to set up their own outdoor cameras in order to record footage of a variety of species. For less than £100, bird lovers can purchase nest boxes with hidden built-in cameras that will wirelessly stream footage of breeding activity to the owner’s computer. For a similar or slightly larger investment (usually around £125-£150), it is possible to acquire a trail cam that can be positioned at watering holes, feeding stations, and paths frequently used for animal commutes; these motion-sensitive devices are generally fitted with infrared lights to facilitate the collection of images of shy, nocturnal animals as well as more commonly seen diurnal species. Luckily for those nature-lovers who lack technology of their own, there are a number of websites where it is possible to view footage—in many cases real-time streams—from cameras that have been set up around the world. A number of zoos and aquaria broadcast live feeds of animals in their collections, while nature preserves and conservation organisations provide films of animals living in the wild. Birds are perhaps the easiest and most common subjects, but mammals such as bats, wild cats, and ungulates are also frequently targeted. 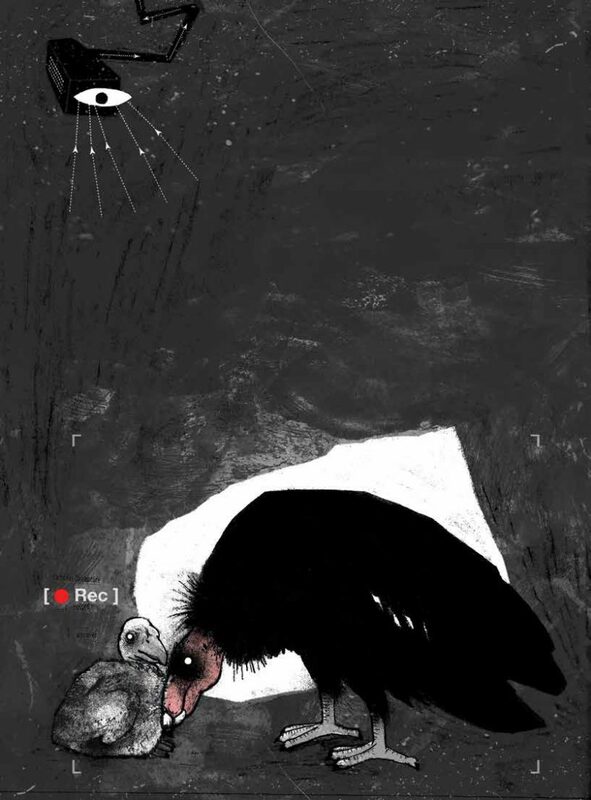 Although some viewers find it difficult to watch the footage when things go “wrong”—nests are abandoned, individuals are injured in fights, a predator is seen dismembering its prey—the public has generally responded very positively to these behind-the-scenes glimpses into the daily routines of animals. This has been true even in the case of species that are not particularly attractive or popular. Case in point: the California condor, an impressively large (if not beautiful) bird whose online feed has captivated hundreds of thousands of viewers despite the species’ lack of obvious star quality. 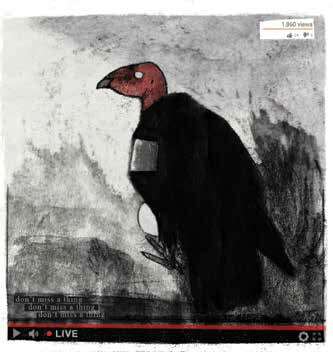 The condor is one of many live-streamed animals whose video feeds were originally developed not for entertainment, but for the purpose of research and conservation. In the American state of Ohio, for example, trail cams have been used to document the return of apex predators such as bobcats and coyotes to a watershed that was once ravaged by mining activity; footage showing a female bobcat and her young kittens has suggested that the ecosystem is finally rebounding.Elsewhere in the state, a separate project uses the same technology to locate and eradicate invasive pigs that destroy the habitat. As the technology improves, the devices will likely become smaller, more affordable, and more energy efficient, with greater storage capacity and the ability to produce clearer images. Perhaps they will be coupled with audio and image recognition so computers can automatically analyze content, or be paired up with citizen science efforts so that viewers can collect rigorous data while watching footage for fun. There has been a similar trajectory in the realm of audio recording, which has led to, for example, the creation of publicly accessible databases of recordings and also free analytical software for lay enthusiasts.Comparable developments for film recordings could increase public interest even further and help even more people establish their own camera feeds. Given the popularity of digital media in general and videos / video feeds in particular, live nature feeds are likely to continue multiplying, adding more species and habitats as time goes on. Cameras have come a long way since they were first invented in the 19th century, and this latest application is a powerful way to both bridge knowledge gaps and engage non-scientists. Although one day video footage might be all that remains of many species, there is also every reason to hope that film technology could be a critical factor in collecting the data and promoting the attitudes needed to save threatened wildlife. Case study: Interview with Supervisory Wildlife Biologist Joseph Brandt, from the Fish and Wildlife Service (USFWS) California Condor Recovery Program. How did you first get the idea to install monitoring cams for your project? From 2001 through 2005, the US Fish and Wildlife Service (USFWS) observed low reproductive success in condors nesting in California. Many of the condor nests were failing because parents were collecting small, coin-sized pieces of trash such as pieces of plastic, bottle caps, glass, and metal washers and bolts (collectively referred to as microtrash) and feeding these items to their chicks. Over time, this would lead to an impaction in the digestive track, causing the chicks to slowly starve, suffer from stunted growth, and eventually die. The Service partnered with the Santa Barbara Zoo in 2007 to develop a nest management strategy that was meant to closely monitor nests and reduce nest failure by intervening when problems such as microtrash were observed. Nests were monitored by human observers for 30-40 hours each week, and once a month biologists would enter the nest to check on the egg or chick. In 2010, a USFWS student biologist, Katie Chaplin, spent countless hours researching and learning how to set up Internet protocol (IP) cameras, wireless networks, and solar power systems in order to improve the condor program’s ability to monitor breeding activities and more quickly identify potential problems at the nests. Her work to develop the camera system was instigated by a condor nest that had failed despite being monitored and checked. 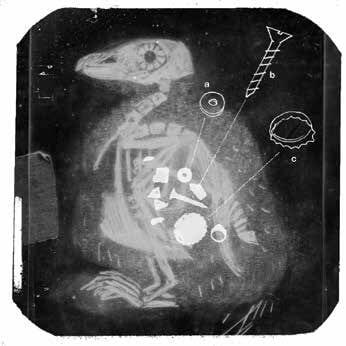 She believed that cameras placed in nests would allow the team to better monitor the nesting behaviors and the development of the eggs/chicks. She was right. After testing the system at a feeding site at Bitter Creek National Wildlife Refuge (NWR) in 2011, we installed the first nest camera in 2012 at the South Potrero nest. For the first time, biologists were able to closely watch and record condor nesting behavior in the wild. Since that time, we have used cameras to monitor 11 of 35 condor nests. Six of the nests monitored with cameras have successfully fledged chicks (16 chicks in total fledged during that time). What unique benefits did the technology add to your project? Camera systems have provided us with a much more detailed and efficient way to monitor condor nests in the wild. Previously, biologists would spend hundreds of hours watching nests over the course of the breeding season, and they could only do this from hundreds of meters away using a scope. With the cameras, we have a record of all daylight hours at each nest; observers only watch for a few hours every few days and can quickly review footage at an increased frame rate in less than an hour. We also no longer need to disturb the birds at the nest by visiting in person. Ultimately, while it does take a lot of work to set the cameras up, we end up using a lot fewer resources—and recording much more detailed data— than when monitoring the nest directly in the field. Thanks to our partnership with the Cornell Lab of Ornithology, the camera has also been an incredible outreach tool. We approached the Lab in 2013 with the hope of streaming one of our nest cameras live on their website (allaboutbirds.org/condors). This required some additional funds and the introduction of infrastructure capable of connecting the nest camera feed (in a remote site) to a location 20 miles away that had the capacity to upload the footage to the Internet. We were finally successful in 2015, when we were able to broadcast a live stream of a condor chick that was four months old. In 2016, we were able to start our live stream much earlier and viewers were able to watch a condor egg hatch in the wild; audiences have since been following the development of a condor chick that is now very close to taking its first flight. Many hundreds of thousands have now had the opportunity to observe condors as they nest and interact with their young. It has been incredible to see people’s reactions change as they begin to develop a connection with condors. Being North America’s largest vulture (and largest land birds), condors might not be the easiest on the eyes, but they make up for their looks with comical and endearing personalities. Do you have plans to continue using this technology? We will continue to use cameras for monitoring nests and as an outreach tool. We may try using different styles of cameras and power systems to improve our view of the nests. We also may use IP cameras to help us with other types of monitoring; for example, cameras could be used to observe the behaviors of captive-reared condors that are held in our flight pefor a time before they are released into the wild. We have also advocated for the use of nest cameras at other condor release sites. Additionally, we have been able to provide technical advice to other researchers and conservationists who have approached us in the hopes of setting up cameras to monitor other bird species, such as white pelicans, seabirds, grasshopper sparrows, and golden eagles. What are the greatest conservation benefits of using the camera technology? The work that we are doing proves that camera technologies can be used as a tool for endangered species management. The remote and less intrusive form of monitoring that cameras allow could be used in a variety of applications to better understand specific threats to particular individuals, species, or habitats. In terms of our particular project, the the footage we collect is influencing condor management decisions in real time. It has allowed us to prevent nest failure in a number of ways. We have rapidly detected egg predation such that we were able to substitute a missing egg with a captive-laid egg so that the wild nest could continue. Cameras have also allowed condor chicks that were treated for injuries to remain in the nest rather than be held captive, since the cameras allow us to monitor their recovery closely. For example, we had a chick with a broken bone in its foot; a consulting veterinarian could inspect our footage remotely rather than disturbing the chick and/ or taking it into captivity. 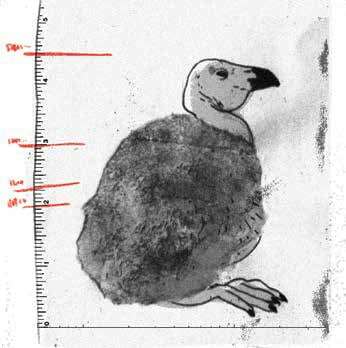 Nest cams aside, what else should people know about the condor project? While we are managing nests to increase the number of condors produced by the wild population, the leading impediment to recovery in condors is mortality from lead poisoning. Condors are exposed to lead by ingesting the remains of animals that have been shot with lead ammunition. 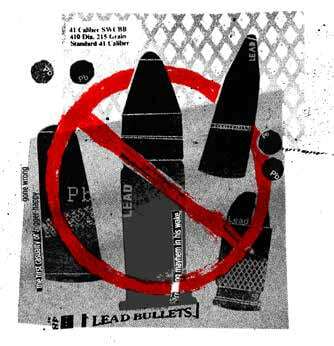 We are doing a lot of work to educate the hunting and ranching communities about the impacts of lead ammunition and how making the switch to a non-lead alternative can provide an uncontaminated food source to condors and other scavenger species. For more information about those efforts, please see hunting with nonlead.org, a website managed by our partners at the Institute for Wildlife Studies. We also are reaching out to schools with award winning curriculum called Condor Kids (condorkids. net). We will soon be rolling out an educational tablet-based game called Condor Country (condorcountrygame.com). Both target youth who might not otherwise be exposed to conservation efforts such as the California Condor Recovery Program, with the goal of connecting them to the natural world and teaching them about the importance of endangered species conservation. While the condor program has many partners, The Santa Barbara Zoo has partnered with us on these educational projects, our Facebook page (Condor Cave), and the condor field program in Southern California. Caitlin Kight is an editor, writer, and educator affiliated with the University of Exeter, caitlin.r.kight@gmail.com, http://www.caitlinkight.com.